Art WA8RMC is preparing for a production build of a new version of MiniTiouner-Express units called “Rev B”. The small design change allows a push-on jumper to select either (a) allow external power supply to feed voltage to the board and any LNB or (b) to have the hardware unit powered by the 5V on the USB-3 cable. The shipment of 100ea Serit tuners is expected to arrive around October 10. The world-wide inventory of remaining “Rev A” units is quite low…and might run out before the newer units are assembled and fully tested. Charles G4GUO has fixed one bug for PLUTO units with the v1.25LP10 software release. One user of the v1.25LP10 software (John G4BAO) discovered that there is a coding design problem with the LimeSDR-USB and LimeSDR-mini units. With LimeSDR-USB units, if frequency selected is <2.0 GHz, then then code did not select the correct output port and the RF power output was too low. With LimeSDR-mini units, if frequency selected is >2.0 GHz, then the code did not select the correct output port and the RF power output was too low. Charles has prepared a new v1.25LP11 of the software and Ken is getting ready to re-test at his lab and then prepare for this new release to be uploaded to the www.DATV-Express.com web-site. Ken W6HHC has prepared a new Block Diagram that illustrates that the DATV-Express software now supports four different hardware boards. 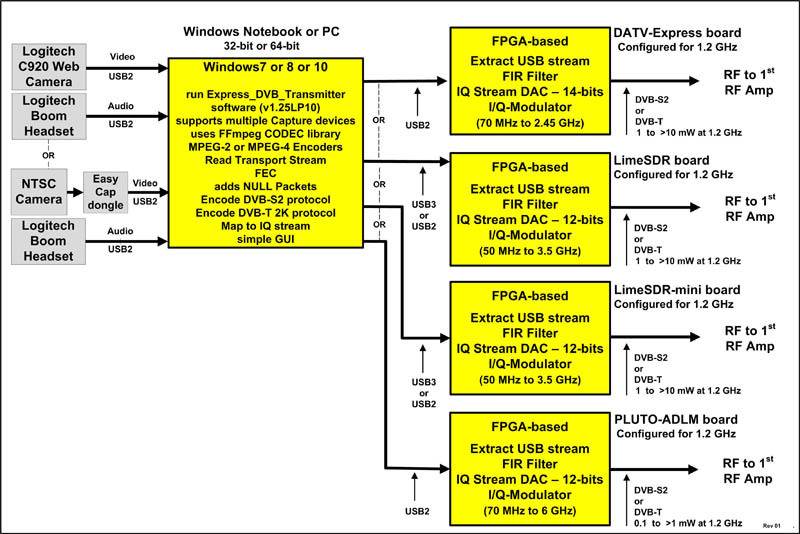 Block Diagram of DATV-Express software supporting four different boards. Ken plans to update the DATV-Express User Guide to emphasize that DATV-Express has transitioned to become solely a software product for the future. During September, Tom WB6P completed the gerber artwork for “Rev B” of the MiniTiouner-Express printed circuit board. The artwork and other PCB files have been sent to the PCB-house for fabrication. .
Just a note that the DatvExpress v1.25LP11 software for selecting and controlling the four different exciter board models has now been successfully uploaded as a zip file to the DOWNLOADS page on the www.DATV-Express.com website. As a side note: while testing the v1.25LP11 software I came to realize that I did not have test equipment in my home lab to measure RF power (easily) at >2.0 GHz. My trusty Rigol DSA815 spectrum analyzer only measures up to 1.5 GHz. 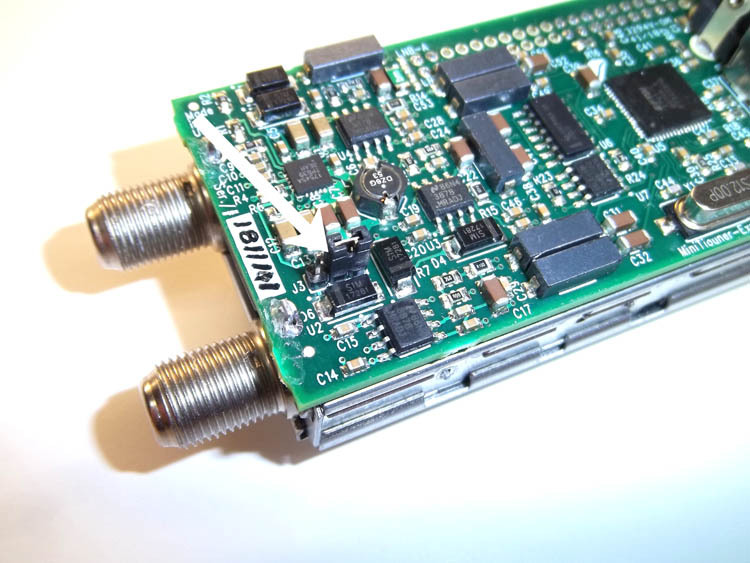 So I had to rely on the v1.25LP11 testing performed by Charles G4GUO and John G4BAO with the LimeSDR-USB and LimeSDR-mini boards at >2.0 GHz.. Download the NOTES_v1.25LP11.txt file to understand the details on the power-out-level issues when running with the LimeSDR-USB and LimeSDR-mini boards. Last edited by KenW6HHC on Thu Nov 29, 2018 2:04 pm, edited 1 time in total. I suppose the inevitable question (from a UK perspective) is: Why do you need to run such a high SR? Is your video source that high res/fast motion that it needs almost broadcast-quality HD bandwidths? You can input SD or HD, DVBS, S2 any FEC or PIDs the Strong box doesn't care, the output is DVBT 720P, it works great, looks superb! Vmix wouldn't run smoothly, GOP problems maybe? I did wonder if someone might know which aspect of the PC is important: to get best bang for buck...speed/ram/cores??? Art WA8RMC reported he picked-up and tested the “first articles” of MiniTiouner-Express unit’s design called “Rev B” from the assembly house. All units fired right up…although one unit needed to have the USB-chip solder refluxed. Art observed that he observed some voltage drop at the end of the USB cable plugged into the computer USB-3 port. Use a short USB cable if you plan to obtain power from a USB-3 port using the new jumper. Quality brand USB-3-grade cables are not longer than 2 meters and are recommended. New RevB of MiniTiouner-Express with arrow pointing to the new J3 jumper set-up that was added. The push-on shorting plug is shown positioned (away from end of the board) to configure power supplies as the original design (not USB-3 powered). It important to note that the new RevB units will ship with J3 configured to work like the original design. 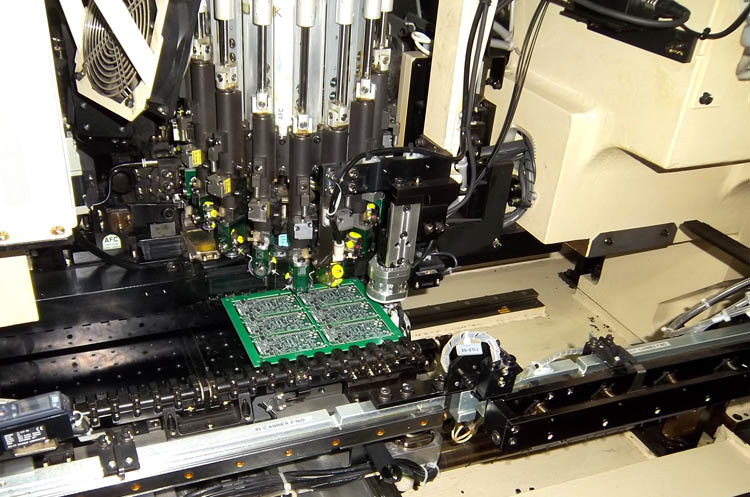 The photo below is the Fuji “pick-and-place robot” for SMT PCBAs. The PCB panel-array is designed to hold six boards. The assembly house started to complete the rest of the 100 unit production run on Friday, Nov 02. The fast FUJI “Pick-and-Place” robot can complete each unit in 5 seconds, 30 seconds for the PCB-array of six boards. Charles G4GUO had fixed one bug for PLUTO units with the v1.25LP10 software release. v1.25LP11 of the software was released to the www.DATV-Express web site DOWNLOADs page after Ken independently tested at his lab. No new problems have been reported with v1.25LP11. Charles did say he also improved his GPU LDPC decoder using a modification to the algorithm he read about in an academic paper. Ken W6HHC Plans to upgrade the MiniTiouner-Express User Guide to include the new power supply options available with the addition of J3 in RevB. Ken is also working to update the DATV-Express User Guide to emphasize that DATV-Express has transitioned to become solely a software product for the future. If anyone is interested the improvement to my GPU LDPC decoder uses the Self Corrected Min-Sum algorithm. Thanks a lot for your DATVExpress software. Anyway I have some problems...I have tested it with a PC windows (core i7) 10, up to date with Pluto and lime sdr mini. No major problem with Pluto. With Lime mini, connected in USB3, latest drivers, the board is often not recognised by the software, I have to relaunch, to disconnect the board, trying again and so on, and sometimes it is not working at all and I have to reboot windows. The dialog between the board and the software during initialisation seems to be very slow (ie when I do a parameter modification in the software I have to wait quite a long time compared with the Pluto). However when it works it is fine. Seems to a mismatch? Drivers problem ? Any idea ?